*each block responsible for management of a particular function can be customized separately and operate as a single unit. WorkingMode - operation mode: normal mode, interaction with positions of another expert, monitoring the trade results. ChannelPeriod, ChannelTimeFrame - period for plotting the channel and timeframe for gathering data. TradingMethod - trading method: breakout/rebound from the trading range. MaximumSpread - maximum spread to start working, not used if -1. TradeDirection - trading method: trade in one or both directions simultaneously. OrderOpenMethod - position opening: averaging, scaling in or hedging positions. OrderOpenMode - calculation of step for opening orders: in pips, in the deposit currency, as a percentage of the balance or as a percentage of the ATR value. OrderOpenStop, OrderOpenStep - distance and step from the current price to set the level for opening a new order. OrdCalcMethod - order counting: each series separately or the total number of orders in different directions. OrderIncrease - increase the number of opened positions by the specified percentage, not used if -1. MaxNumOrders - the maximum number of orders opened at a time, not used if -1. LotCalcMethod - calculation of the trading lot: separately for short and long positions or for the entire basket of orders. IncreasingLot - increase the lot by the specified percentage, not used if -1. StartIncrease - number of the position to start increasing the lot. DecreasingLot - decrease the lot by the specified percentage, not used if -1. StartDecrease - number of the position to start decreasing the lot. MaximumLot - the maximum lot for opening positions. 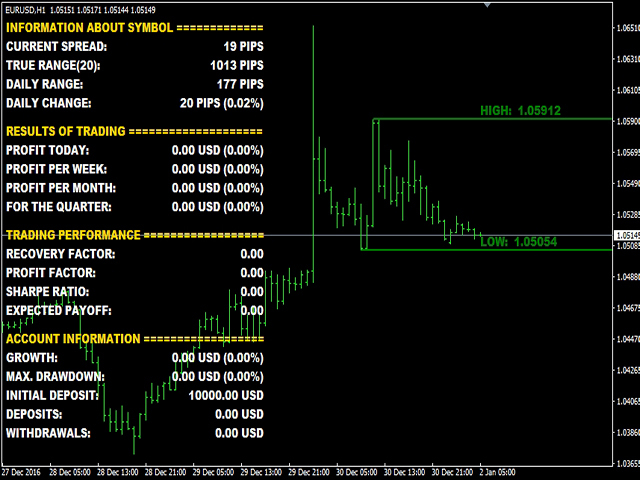 LevelsMethod - setting take profit/stop loss: separately for short and long positions or for the entire basket of orders. LevelsMode - calculation of take profit/stop loss: in pips, in the deposit currency, as a percentage of the balance or as a percentage of the ATR value. StopLoss, TakeProfit - stop loss and take profit, not used if -1. TrailingMethod - trailing stop method: separately for short and long positions or for the entire basket of orders. TrailingMode - calculation of trailing stop: in pips, in the deposit currency, as a percentage of the balance or as a percentage of the ATR value. TrailingStop, TrailingStep - trailing stop and trailing step. MagicNumber - magic number, the EA manages all positions opened manually or by another expert if set to -1. Советник интересный и реально рабочий.Установил на все , автором рекомендованные в описании , пары. Лучше всего проявил себя на AUDUSD и золоте. Оптимизации не проводил-пока не было необходимости.Разве что посоветую начать с малых лотов.